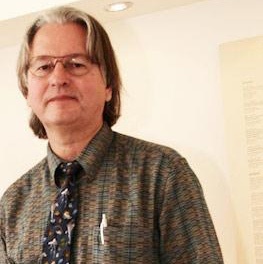 Bruce Sterling is a legendary American science fiction author, best known for his novels and his work on the Mirrorshades anthology, which helped define the cyberpunk genre. He also writes short stories, book reviews, design criticism, opinion columns, and introductions for books by authors ranging from Ernst Juenger to Jules Verne. His non-fiction works include The Hacker Crackdown, Law and Disorder on the Electronic Frontier (1992), Tomorrow Now: Envisioning the next fifty years (2003) and Shaping Things (2005). He is a contributing editor of WIRED magazine and writes a weblog. During 2005, he was the "Visionary in Residence" at Art Center College of Design in Pasadena. In 2008 he was the Guest Curator for the Share Festival of Digital Art and Culture in Torino, Italy, and the Visionary in Residence at the Sandberg Institute in Amsterdam.